In this excerpt from the new Naval Institute Press book Assault on Normandy: First-Person Accounts from the Sea Services, we go on board a tank Landing ship (LST) 50 years after the invasions of Normandy and the coast of southern France with Commander Bergner. On the night of 4 June 1944, the LST-282 pushed her stubby bow into the waves of the English Channel as she headed toward Normandy. After months of planning and training, we in her crew were part of a vast armada preparing to strike the first blow in the liberation of France. My thoughts that night were less about making history than they were about survival. As I lay in my bunk, thinking about what was ahead, I said a few more prayers than I normally did. In fact, the weather was so rough that the invasion was postponed for a day. And so it was that the crew's sense of anxiety was stretched still further. On the night of 5 June we set out once more to embark on the invasion. That night, when it came time to pray, I told the Lord that everything I had said the night before still applied. The LST-282 was commanded by Lieutenant Lawrence Gilbert and also served as the flagship of LST Group 29, Flotilla 10, with Commander J. C. Guillot as group commander. When we went to Normandy in June of 1944, Commander Guillot was on board with his staff and he also served as officer in tactical command of our convoy of minesweepers, five LST's, two rescue tugboat, and two destroyers. Each LST towed a large rhino barge, onto which our cargo was to be off-loaded just off the beach. Thus, behind our brave minesweepers, we were to be the first ship of the first convoy to Utah Beach. At 0242 on D-Day we anchored off Utah Beach. We had something brand new on board for this operation -- an amazing aid to navigation known as Loran. It gave us precise bearings and ranges on two different transmitting stations, so we could accurately fix the position of the transport area. After we followed the minesweepers in and anchored, the transports anchored in relation to the LST-282. We also carried demolition teams to destroy beach obstacles; they shoved off for the beach in our LCVPs at 0246. Two of our six boats were swamped on the beach, but the officers and crews were recovered. Then it came time to load the bulk of our troops in LCMs from the transports so they could go ashore at H-hour. There were some good-sized swells heading in toward the beach. It was still dark as the troops climbed down the debarkation nets on the ship's sides. I recall seeing the swells bring the landing craft up to meet the descending soldiers. It was tricky, forcing the soldiers to jump in at just the right time. They had to be pretty nimble to avoid serious injury. One of the soldiers whom we carried to Normandy was a man named Werner Kleeman, a Jewish man who had escaped from a concentration camp in Germany. I learned of this later when I saw him being interviewed on television by Tom Brokaw on the occasion of the 45th anniversary of the invasion. After his escape, he went initially to England, then to the United States, where he later enlisted in the Army. He was assigned to a communication unit of the 4th Infantry Division. As he told Brokaw, a photographer assigned to one of their units wanted to let the headquarters in England know about everything had gone well. When the ship was about six miles offshore, we unloaded Army cargo onto our rhino barge. After the soldiers got onto the barge, this man took a photo, with his camera pointed toward our bow. As Kleeman explained, since the photographer didn't want to break radio silence on D-Day, he tied the negative for this picture onto the leg of a carrier pigeon that was supposed to fly back to England. The next thing they know the photo cam about four to six weeks later. The allies had taken Cherbourg, including capture of a German headquarters unit. On the desk of one of the officers was a German newspaper with that picture printed on the front page. The hull number of our ship -- 282 -- was clearly visible in the photo. Underneath the photo was a caption explaining that the carrier pigeon became exhausted and fell behind German lines. It didn't make it to England, so the Germans developed the film and sent the picture to the newspaper. The caption further said that the barge onto which the LST unloaded hadn't made it ashore because it had been destroyed by German artillery. This was not true, because Kleeman has told me that none of the 4th Division equipment from our ship was lost. The LST-282 was set up as a hospital ship, providing initial medical care to wounded personnel and then transporting them back to England. As I remember, we had three surgeons and 24 pharmacist's makes on board for the invasion. The bulkheads on the sides of the ship's tank deck were equipped to mount litters. The wardroom was set up to handle the most serious cases of surgery. We started getting some of the wounded from Utah Beach, but then we moved and began receiving casualties from Omaha too because the fighting was much fiercer there. All types of craft brought them to the LST-282. I didn't see the action ashore, but I saw the results. The soldiers' uniforms were impregnated with a chemical to protect against poison gas. Before sending the wounded below to the tank deck, medical personnel on the main deck cut off the uniforms from the soldiers and piled them on the fantail. The sun shone on that stack, and the odor produced by the combination of blood and chemicals was most unpleasant. I didn't go back there anymore. The next day we went to England and unloaded our human cargo at Southampton. On about D+3 we carried a load of Sherman tanks to Omaha Beach. these were among the first to cross the English Channel, because the Army had an urgent need for them ashore. When we were on the beach we could hear the big guns inland and knew the tanks would soon be headed there as well. One we beached the ship, we had to wait a few hours for the tide to go out so we would be able to put the tanks onto dry land. For the evening meal the skipper directed the cooks to fry pork chops for the Army boys. He wanted them to go into battle with a good meal under their belts. When we returned to England on that trip, we carried wounded German Prisoners along with the Americans. Since my parents had come from Germany and I spoke German, I was able to serve as interpreter when the doctors needed to ask questions of the wounded prisoners. We had one hard-boiled SS trooper, a sergeant, who had popped up out of a burning tank. Once on board the LST he said he didn't want his dressings changed. He had apparently been in a dazed condition when he was captured, and the British had applied the initial battle dressings. All we could see was his eyes, but it was time to change the bandages. He didn't want our doctors to do it, because he assumed they would kill him. I convinced him that the doctores would not harm him and that we were not the type of people that he had been told we were. Than he asked, " Do you, as an officer, think I did my duty?" He explained that the heat inside the tank forced him out and that the British had grabbed him while his uniform was on fire. It seemed to me that he wanted some sort of reassurance that he could go to a "military heaven" after being captured alive. When I told him that I thought he had probably done about as much as any human being could under those circumstances, he said something that I will never forget. "Well, those were British; I knew they weren't Russian -- even if they had cut me into a million pieces, every one of my pieces would have fought on. " That gives you an idea of the hatred that was part of the indoctrination the German SS troopers received. Fortunately, the LST-282 was relatively safe from enemy fire during her stay off the Normandy beachhead. Enemy shore batteries had been a big concern to us beforehand. We wouldn't have been in range of anything except the largest guns, but the Allies know that the Germans had them on Pointe du Hoc, on the bluff between Omaha and Utah. Rangers under Lieutenant Colonel James Rudder were assigned to scale those cliffs and silence the guns. They met a lot of opposition, being fired down upon by machine guns from the top. But when the soldiers finally scaled the cliffs, they discovered that the Germans had moved the big guns elsewhere. If those guns had still been in place, we probably would have been fired on. The several trips we had made safely between the beachheads and England following the invasion had given me a sense of confidence that I could withstand another operation. After Normandy, we went to the Mediterranean so the ship could take part in the invasion of southern France. We knew that this time we would be beaching on D-Day itself. When we were loading north of Naples, I talked to my close friend and roommate who was the ship's gunnery officer, Peter Hughes. I said, "Pete, I feel quite different about this one. I'm not as concerned. " He turned to me and said, "You know, it's strange you should say that. I really wasn't so afraid in Normandy, but this time I have a bad feeling. " It appeared that we would have an easy day of it on 15 August. We waited offshore after watching the H-hour bombing of the beach and saw our LCVPs return safely after landing assault forces on Green Beach. We saw no enemy planes. With our binoculars we could see resort homes and the hills behind them. In a sense, we sunbathed on the Riviera that day as the ship circled and waited in the transport area for our turn to go in. Our turn came late because there was no immediate requirement for the primary cargo we were carrying: 155-millimeter Long Tom artillery pieces of the 36th Infantry Division. The main deck and tank deck of the LST-282 was jam-packed with those guns and their trailers full of ammunition. We didn't get the word to the beach until about nine o'clock in the evening, after the sun had gone down. We were about three-quarters of a mile from Green Beach. I was on the forecastle, standing on a raised gun tub. My duty was to handle the sound-powered telephones on the forward battery of 20-millimeter and 40-millimeter anti-aircraft guns. Hughes, on the conning tower, was on the other end of the phones. We spotted two planes coming in from over the land, far away off the starboard bow. We were talking back and forth about what the planes might be. Suddenly, there were three planes instead of two, and the third one appeared smaller and, we assumed, farther away. The reason it looked farther away was that it was not a plane but a small radio-controlled glider bomb. It had been launched unseen from a Dornier 215. It headed initially toward the transport area, then turned at a right angle and dived right onto the LST-282. We got a few shots off with the ship's guns, but they were well astern of this bomb that was probably moving at several hundred miles an hour. It hit right in front of our ships wheelhouse and went into the main engine room, where it exploded. Pete was killed instantly, blown from the conn down onto the main deck. My own first conscious memory is of being on the main deck rather than on the elevated gun tubs. Whether I was knocked down by the concussion or jumped because of fear, I don't really know. I looked back at the conn and could see that it was all crumpled. There was no sign of life. Flames were starting u. The next 10 to 20 minutes were terrible. The Long Tom artillery ammunition began cooking off and exploding, as did the ammunition in the ship's own magazines. There never was any formal order to abandon ship, but people saw the obvious and jumped overboard. I tried to warn some soldiers to stay on board, because we had been taught in midshipman school not to leave the ship until directed because conditions might be even worse in the water. But soldiers get nervous on board ship, where there are no foxholes, so they said to me, "F___ you," and off they went. The first lieutenant had the bow doors halfway open when the bob hit and all power failed. The bow ramp was still closed, and all the troops manning their vehicles on the tank deck would have been trapped. The rear cables of a large cargo elevator on the main deck were parted, however, causing the rear portion of the elevator to fall onto trucks in the tank deck. That formed a ramp from the tank deck to the main deck. Many injured soldiers, some with their uniforms on fire, scrambled up that ramp to safety. It was similar to the way red ants escape from an ant hole when someone pours in gasoline. By now the ship had moved to within about half a mile of the beach. Lieutenant Gilbert, the skipper, got the Navy Cross for his actions that night, and he deserved it. He ordered hard left rudder, which kept the exploding LST-282 from moving in among the LSTs already lined up on the beach. As it was, we careened off the port, and eventually ran aground on some rocks in front of a beautiful resort home. In addition to his ship handling, the skipper rescued a signalman, George Heckman, who had a badly broken leg. He carried Heckman down three flights from the bridge to the water's edge, and there someone else took over and began pulling him ashore. Then the captain went back and got the engineer officer, Edward Durkee, who was unconscious and had a back full of shrapnel. The captain secured him by his life belt to the rudder post. Both were later recovered in an unconscious condition by rescue craft. The skipper himself had been wounded severely in one arm, so he did those rescues with one arm. The last people who left the ship swam ahead, trying to beat the hulk ashore. The engines had stopped running as soon as the bomb exploded, but momentum continued to carry the ship toward shore. I myself finally jumped off the port bow. I think I let myself down to the anchor so I wouldn't have to jump so far. In midshipman school I was a non-swimmer and had to go to swimming class when the other guys went to physical education. All I had learned during my youth in the Texas hill country was dog paddling in various creeks. But I beat that LST ashore. I had an inflatable life belt around my waist, and it worked well. The Army had criticized those belts after so many men were lost in Exercise Tiger, claiming that men were pitched forward, forcing their faces into the water. I have to say that my life belt was effective when it came to the test. When we got ashore, we got behind a large rock on the beach. As the ship got closer, the good swimmers went out and helped the wounded men get ashore. We dragged them behind the rock because we were afraid the exploding ammunition might send shrapnel onto us. Eventually, when we couldn't find any more shipmates or army men, we went up a road to Green Beach. Others, in the water astern of the ship, were rescued by boats from the other ships in the area. We boarded a sister LST and backed off that night. At that point I panicked and began having what might be called hallucinations. I wanted to get off and go back to my own ship, worried that Pete Hughes might still be alive and I could save him. I calmed down when a shipmate said he had seen Pete lifeless on the deck. It was a horrible night for many of us. Our ship was still burning and, I have been told, smoldering for several days. In those hours afterward I didn't want to look at the LST-282, but somehow I kept doing so. For many years after that I certainly had no wish to set foot on that beach again. But then, in 1984, the various nations that had been involved in the Normandy D-Day got together to observe the fortieth anniversary. In June of that year I watched the celebrations on television with such great interest that my wife, Gladys, encouraged me to go to Europe that fall. I visited some cousins in Germany and also went back to the beaches at Normandy and southern France. I stayed overnight at Nice and then got oriented by going to the American consulate there. I learned from people there where our landing site, Green Beach, near Saint-Raphael to the area, so I followed my cardiologist's advise about walking and set out on the four-mile trip to the beach at Cape Dramont. After a while the coastline looked very familiar. I tried to question a French lady washing a car, and I frightened her because she couldn't understand English. Fortunately she found her husband who could. I inquired about the ship that was bombed and burned, an he told me that the abandoned ship had been on the rocks for many years. After they opened a bottle of wine to celebrate my return, he drove me to the exact spot where the LST-282 had ended her last voyage so many years earlier. I identified it myself by finding the big rock that we had moved behind when the ship was still exploding. The Frenchman left me there -- alone. I was carrying with me a photo of the LST that someone had taken the day after the ship was hit. In the background of the photo was a beautiful resort home. It was still there in 1984, so I decided to find the exact spot from which the picture had been taken, then take one of my own. As I climbed around in the boulders on the beach, I stopped at one point to rest. I looked down and I saw a coiled wire cable, hollow in the center. I recognized it as the core of what had been a piece of 6-inch wire rope, the type used as the bow line for LSTs. I knew it could not have come from a merchant ship because along that coast there are no piers for a ship of any size to moor. The luxury liners must anchor offshore and transport their passengers ashore in smaller vessels. The remaining strands of wire showed evidence of burning and many years of rusting. I knew it had to be a portion of the bow hawser off the LST-282. Someone had evidently hidden it among the rocks. He probably planned to come back and get it but never did. As I sat there and remembered the terrible things that had happened that night, I began crying. I have seldom felt so alone or so strange, because I was there for people whose lives had ended 40 years earlier. I wished for my wife or a shipmate -- someone -- to share the moment. I called Gladys that night and told her I had just experienced one of the most stirring days of my life. Hans Erich Bergner (1922-1993) received his bachelor's degree in history and government from Southwestern University, Georgetown, Texas, in 1943. He subsequently received a master's degree in administrative education from Southwest Texas State University in San Marcos. 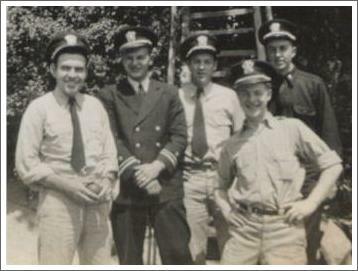 He took V-7 officer training at Columbia University in New York and was commissioned an ensign in the Naval Reserve in November 1943. After his service as assistant gunnery officer in the LST-282, he served in the LST -1043 in the Pacific, finishing as commanding officer. The war ended before the ship could get into combat. After his release from active duty in April 1946, he entered the field of education, spending 17 years in the school system in Comfort, Texas. He was a teacher, bus driver, coach, principal, and superintendent. From 1964 until his retirement in 1977 he was superintendent of schools in Fredricksburg, Texas. He complete 21 years of Naval Reserve duty in 1964 and qualified for retirement as a commander. Among his reserve duty was service as an instructor at Reserve Officer Candidate School at Long Beach and Newport in the 1950's. After retirement Commander Bergner lived in Fredericksburg, where he was a German-speaking volunteer docent in the Verems Kirche (Society Church) museum. He died in October 1993, a few months after the interviews for this chapter of Assault on Normandy.